To complete the FERPA Tutorial and Quiz and Statement of Responsibility, log into Blackboard with your ULink username and password. Blackboard can also be accessed by clicking on the above link or by going to the University of Louisville's Homepage (louisville.edu) and clicking on the 'Blackboard' link. (NOTE: If you are unable to log into Blackboard to take the quiz, please send an email to Lamar Braggs in the Registrar's Office at l0brag01@louisville.edu). 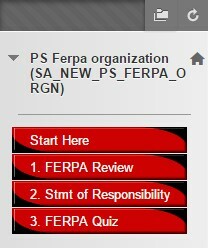 Once logged into Blackboard, click on the "PS FERPA Organization" link under the "My Organizations Plus" menu. Begin on the 'Start Here' page and go through Steps 1-3 to complete the FERPA Tutorial, Statement of Responsibility, and Quiz. The results of your FERPA Quiz will be reviewed prior PeopleSoft access being granted. *Completing the FERPA requirements does not guarantee report access.